Scoozy 250 SS E-bike—Sensible Simplicity. Sleek and smooth, yet brightly colored, this Scoozy 250 SS was a great riding friend. I considered titling this post “Urban Warrior”, as that is really the inspiration for this bike. It is designed to be a lightweight E-bike to take on the city and some of their tight legal regs for E-bikes. At under 40 lbs., and with great agility and strength, it seems to be the perfect bike for that purpose. It is a true pedelec (no throttle), which helps to further its intended goal for riders in those afflicted areas where E-bikes might not be as welcome as others. Plus it is fairly stealthy too. Maybe off track a bit, yet I think messenger bike with benefits could be envisioned as you ride. Simple is as simple does. If you have looked around, you know most E-bikes are not this easy going in the rear. You might recall my last experience with Scoozy E-bikes was with a slightly more powerful E-bike with throttle and cruise control as its control system. Today they have moved from the Ride Scoozy name to a simpler one, kind of like their bikes. Personally I like simple, and that is strengthened for me in the E-bike world, with so many companies over-complicating their bikes with fancy new electrics that might be too unreliable (or non-easily understandable). I just want to ride with a smile, not have to know every smart code on earth. Another plus on the Scoozy list are the quality components from front to rear that help my confidence with every ride. 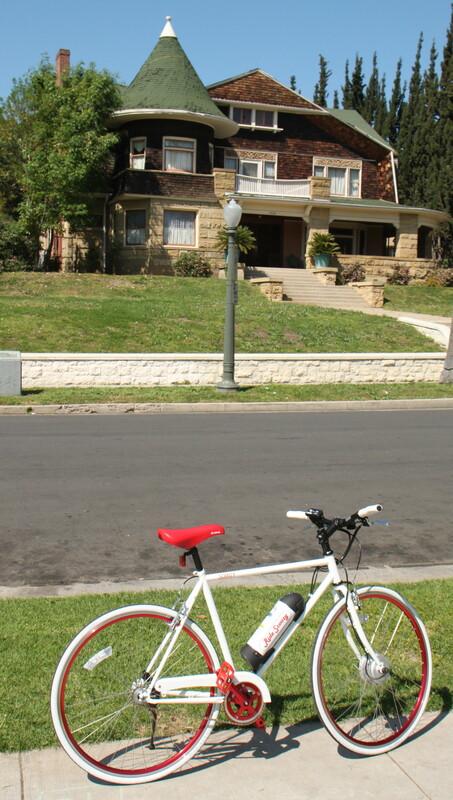 It has a fixie kind of style with a color combo that drew many compliments during my jaunts. Although this type of bike is not my favorite by any means, it did really speak to me so many times. It is possible to enjoy being out of your little box, a fact driven home by the 250 SS (single speed). Yes, one speed, no shifting. That is just a part of the simplicity I am embracing here. If you want more info, get a cycle computer. I liked the 250 SS just the way it came. The previous Scoozy I tested was also a single speed, but having the throttle on that bike was my preference. It made starting out just a bit easier, especially on mild to steep grades. On this 250 SS it wasn’t that much more difficult as the PAS (automatic pedal motor assist) comes on pretty quickly as you start pedaling. And once it is on, in one of three power levels, off you go with a smile. 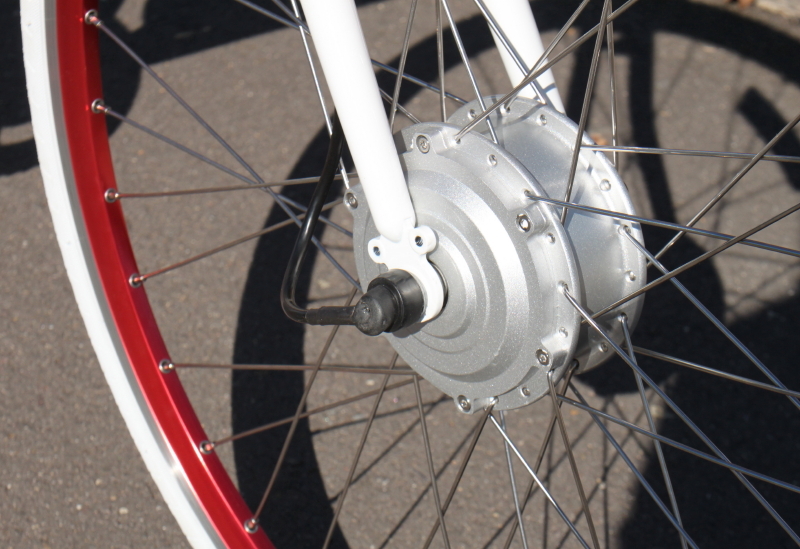 To maintain the motor’s power you do have to continue pedaling, but with only as much effort as you desire. As far as the bike’s gearing is concerned, you have options there. As delivered to me the gearing was a bit low, yet with many rides behind my belt it is the one I would stick too. By having the rear gear a tooth or two different, you can make climbing easier at the sacrifice of less top speed—or go the other way around if you like to make good time on a ride. I got the 18 tooth rear gear, the one I would recommend. And if you some reason it doesn’t work for you, changing it isn’t too hard or expensive. And making good time on a ride, that is easy with the chosen set-up on the bike. 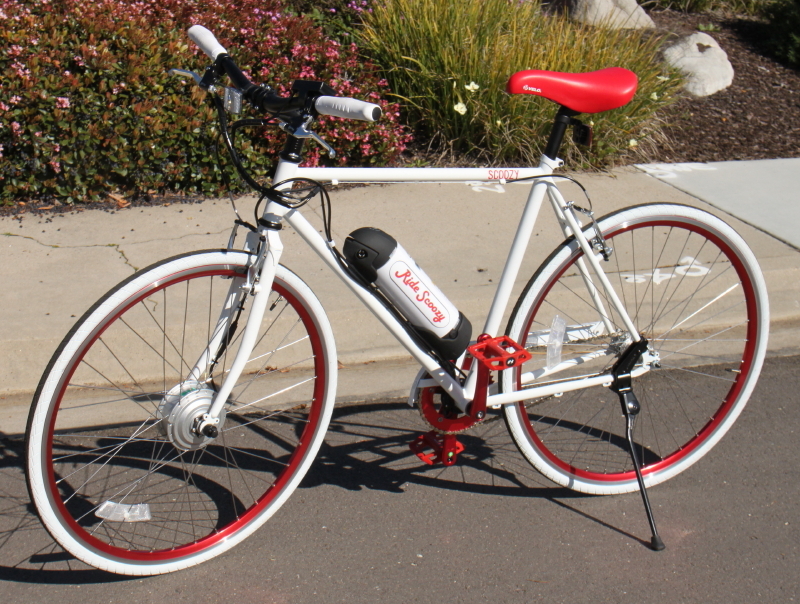 Enough power for most any ride, 250 watts is easy on the bike’s weight and on battery range. Noticing the geared motor in the front?, me too. On a bike like this, that isn’t radically over-powered, the front placement is almost fully preferable. Many might feel different, yet with even a short ride, you will be hooked on the balance and feel the front motor offers. It too seems a bit stronger than other 250 watt motors I have ridden in the past. I you want some hair-burning power and speed, look elsewhere. But if you want a smooth clean ride that can handle almost any condition, (and at a super reasonable price I might add), then a test ride on the Scoozy 250 SS might be a wise idea. I took this during the LA Tweed Ride—we love Tweed Rides. To follow through with the simple theme, the SS has a small power panel on the bars that shows the battery power (range) left, and the power PAS assist level you have chosen. There are three buttons there—power on and off—PAS choice—and a walking button that holds a slow speed when depressed (I am not too big on walking buttons, yet this one was slow enough to be fully safe). 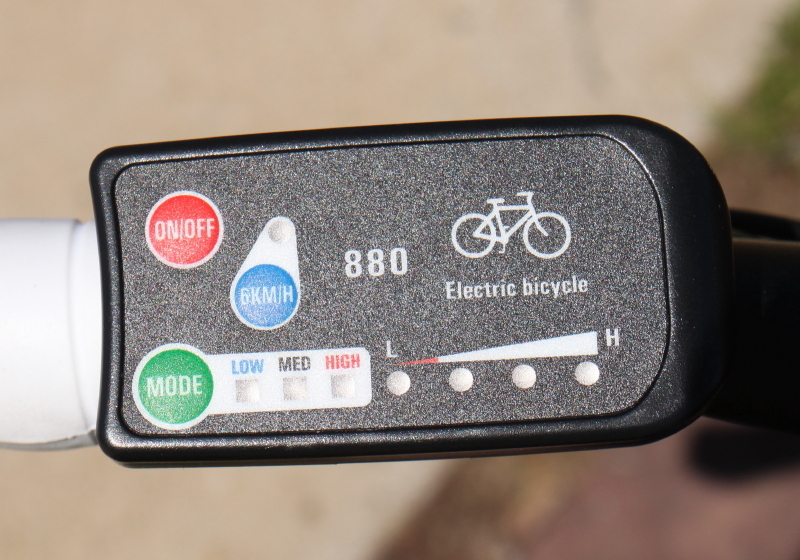 If you want more riding info, you can add a small cycle computer to add speed, time, and temperature info. A bell and lights could easily be your idea on useful riding gear. The brakes fit into the simple theme too. Good, strong, smart and understandable old-fashioned V-brakes are fitted. Today’s’ disc brakes are either junky quality or overbuilt and too touchy to be safe. Having the right brakes is important. I like the choice this bike has on-board. There are some good disc brakes too, yet I vote for simple and strong. 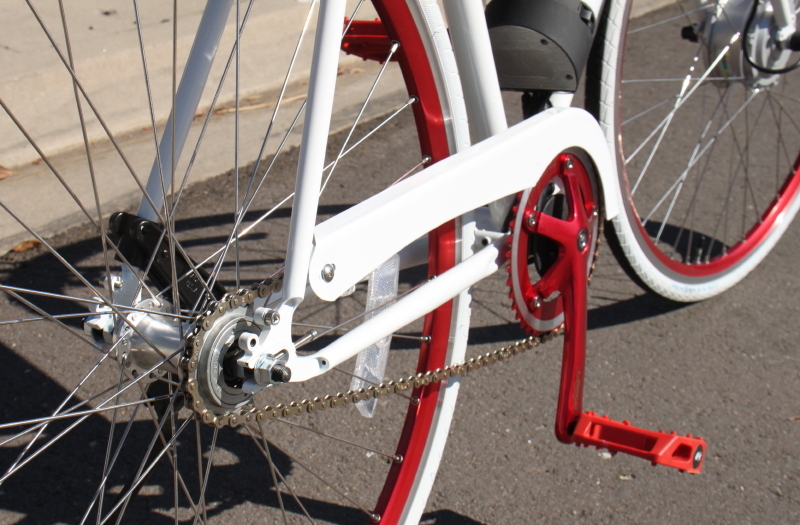 Keep in mind this SS has a strong steel frame with dropout reinforcements to keep you on track. It is missing my desired fenders, but does come with a chain guard and kickstand. It seems to have all the needed threading to add racks and fenders easily if you want them. Easy to assemble (for me and maybe for you). If not, a good buddy or bike shop can help. The frame mounted battery is a large capacity 36 volt unit. It is really the only E-bike noticeable thing on the bike. It can be disguised some I imagine if you wanted. This battery coupled with the power-sipping motor, the light overall weight, and the general efficiency of the bike, will take you very far between charges. There is no set way to say exactly, yet one ride I took was an easy 40 miles and there was still plenty on LED action to be seen on the battery power level display. Simple adds up to smart in so many ways on the Scoozy 250 SS. Now, I do want to mention that this bike can be molded some to fit your personal needs. A throttle can be added at the factory if you so feel the need for one. I mentioned the different rear gears that can be fitted. Three cool color combos are on the books, as are two frame sizes. Like many bikes of its type, you can go even wilder with colors and accessories that help bond you to your bike. I loved it the way it came, adding only front and rear lights for my rides (day and night of course). The more I Ride Scoozy—the more I like Ride Scoozy. I can’t wait to try out their coming all-terrain E-bike—in bright yellow non the less. 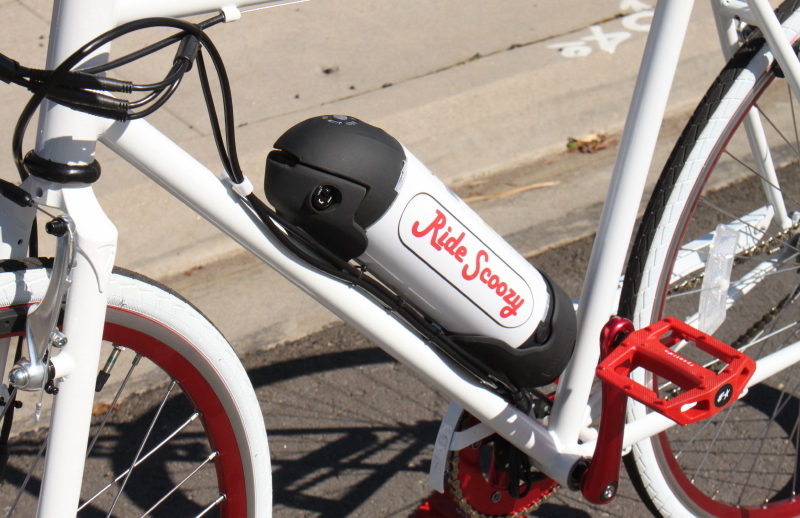 Scoozy (still Ride Scoozy on their website) has a awesome looking 500 watt rear drive version of this basic bike if you want more juice. They are also adding a great looking 20“ fat tire all-terrain E-bike any day now, so you can see that on their site too. They are working out some possible mid-drive E-bikes that might be part of their line-up too. They do nice bikes with the good stuff and at a number ($) that anyone can afford. I can’t think of too many other E-bike shops doing that. I loved riding the 250 SS, you might too, Turbo Bob. “Cycle tracks will abound in Utopia.”—H.G. Wells. You can find them on their website and even Facebook. Of course I added some videos to how you the bike better. This entry was posted in E-bike test reviews. Bookmark the permalink. Man this is a fantastic review! thanks for including so much video content as well, really helped me make a decision. I might go through and watch a couple more of these reviews to get a better barometer on what I want but this is a fantastic resource!